As you know from my previous reviews my daughter loves Caillou. She will soon be turning 4 just like him. She easily relates to him especially when it comes to helping out. My daughter's teacher says that she is her biggest helper. Caillou is confused when Emma is allowed to have extra snacks at preschool. He’s even more confused when Miss Martin explains that Emma has type 1 diabetes. Worried about his friend, Cailloubecomes very protective of Emma, not wanting her to do anything – not even go down the slide! But when Emma outruns Caillou in a race, he soon realizes Emma’s diabetes isn’t like a cold or flu. It’s something Emma has to live with every day...and she’s doing a pretty good job of it. This DVD also includes a cool activity booklet. 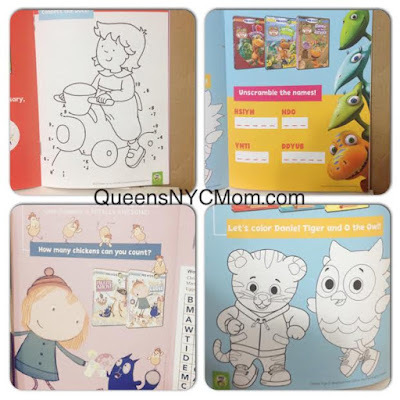 It has pages that you can color with Daniel Tiger's Neighborhood and connect the dots with Rosie. It also has a word search with the Wild Kratts, an unscramble words game with the Dinosaur Train and a counting game with Peg and Cat. “CAILLOU HELPS OUT” DVD will be available on June 16, 2015. The DVD is approximately 60 minutes long and Suggested Retail Price (SRP) is $12.99. You can purchase this DVD at your local retail store. Caillou can be found on your local PBS station and on the PBS app for your tablet or smartphone. Well this just made me giggle and smile. My daughter is named Emma and she too has type 1 diabetes, as do I! I have to get her this even though she is almost 21 I know she will get a real kick out of it. I am glad that this series has some books on things we need to be teaching our kids about. LOVE IT! Sorry I meant DVD above. For some reason I had BOOK stuck in my head! Very nice review, it alomost felt like watching the episode! Thank you for posting about this useful product. I think this is a cute little show. I can't get my son into it yet, but he has started to want to watch shows like this. My memory is so faulty I think I remember seeing this show on PBS when a few of my cousins were little. I love that it is educament for young children. Something to hold their interest but sneaks in some education for them.